Uz. Dr., İstanbul Eğitim ve Araştırma Hastanesi, Göz Hastalıkları ABD, İstanbul, Türkiye Purpose: To present the long-term results of afl ibercept treatment in patients with no previous treatment for diabetic macular edema (DME) in daily clinical practice. Method: A retrospective, single-center study designed to evaluate the functional and anatomic outcomes of intravitreal afl ibercept treatment in patients with no previous treatment for DME. The patients included in this study had DME defi ned by the loss of the foveal pit and central macular thickness (CMT) greater than 300 μm on OCT. Only patients who received at least the fi rst 3 monthly (4 weeks) afl ibercept (2 mg/0.05 cc) injections were included in the study. 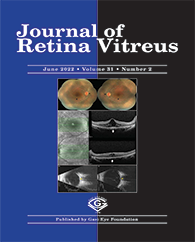 Retreatment was performed if a loss of best corrected visual acuity (BCVA) ≥5 letters were defi ned between 2 consecutive visits or CMT worsened which CMT of >300 micron, or increase in CMT by > 10 %. Results: The mean BCVA (Logarithm of the minimum angle of resolution or recognition -logMAR) increased to 0.55±0.40 (0.1-2.0) after applying a mean of 3.2±0.53 afl ibercept injections (p= 0.001). At the fi nal examination, mean letter gain was 13.5±15.7 letters. At the fi nal examination, gains in Early Treatment Diabetic Retinopathy Study (ETDRS) letters were documented in 44 eyes (69.8%), and visual acuity remained stable in 19 eyes (30%). The mean CMT was 430.8±135.39 μm (242-806) before initiating treatment with afl ibercept and decreased to 303.6±57.7 μm (210- 529) at the fi nal examination (p= 0.0001).